WILLIAMSPORT, Pa. – Junior Brad Stubbs (Clearfield, Pa./Curwensville Area) heads a group of five Lycoming College football players on the All-Middle Atlantic Conference team, earning first team honors as an offensive lineman, the conference office in Annville, Pa., announced on Tuesday, Nov. 14. Senior Mike Ward (Edgewater, Md./South River) was named to the second team and three Warriors were named honorable mention – junior defensive lineman Ahmad Curtis (Effort, Pa./Pleasant Valley), sophomore kicker Jamie Fisher (Folsom, Pa./Ridley) and sophomore returner Dante Gipson (Bordentown, N.J./Bordentown Regional). Stubbs started all 10 games at center for the second straight year, jumping from second team all-conference to first team. He guided a young line that featured three new starters, helping the team average 24.6 points and 308.4 yards of total offense per game. 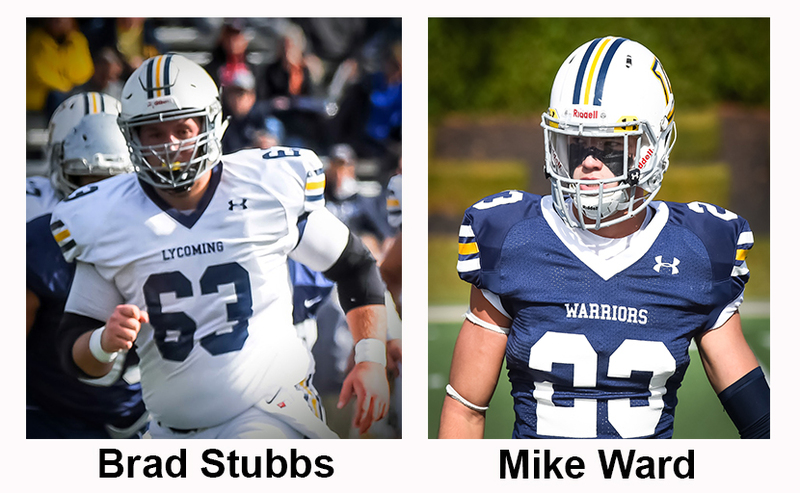 Ward finished his career with the Warriors as one of the top defensive players in program history, finishing sixth in school history with 263 career tackles and led the team in tackles for a third straight year. He posted a career-high 88 tackles as a senior, notching three interceptions and six pass breakups, also forcing and recovering a fumble. Curtis, who started all 10 games at defensive tackle, helped plug the gap all season for the Warriors, as the 6-1, 320-pounder posted 31 tackles, a tackle for loss and an interception for a touchdown in the 44-41 win over King’s. Fisher’s big leg helped him develop into one of the best kickers in the MAC, as he tied the school-record by hitting 13-of-18 field goals during the season. He hit a MAC-season-long 45-yarder against FDU-Florham and became the first Warrior to hit three 40-yard field goals in a season. He also led the MAC with 19 touchbacks off kickoffs and finished the season a perfect 27-27 on extra-point attempts. Gipson turned into one of the best returners in the MAC, leading the conference and finishing 15th in Division III with 728 combined kick return yards. He finished sixth in the MAC with an average of 19.8 kickoff returns and he led the MAC and finished ninth in Division III with 14.6 yards per punt return. The Warriors finished with a 4-6 record.